DRAG SPECIALTIES now has a version of its 2-Up Predator seat available to fit Victory touring models. The new seat not only features custom stitching, it also has a unique shape that uses flexible polyurethane foam for comfort on long cross-country rides. The company’s patented solar-reflective leather used in the seating area is claimed to reduce surface temperature by as much as 25 degrees, offering a cooler seat, higher durability and longer life over conventional leather or vinyl. Carpeting is used on the bottom of the 3/16in ABS thermoformed seat base to protect the bike’s paint, and the seats will also fit with OEM sissy bars. The 2-Up Predator seat fits most ‘10-‘13 Victory Cross Country and Tour, Cross Roads and Hardball bikes. 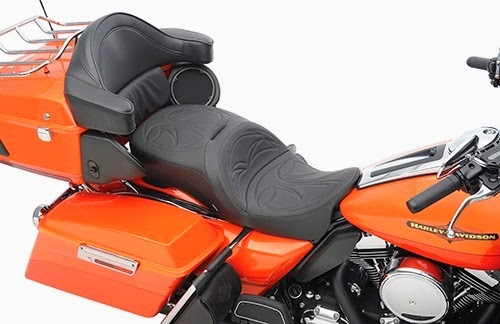 Continuing with its selection of seats for Harley models, Drag Specialties Seats has a new Touring option. Along with crusade stitching, this seat has an improved shape, using flexible urethane foam. The solar-reflective leather, carpeting on the 3/16in ABS thermoformed seat base and rubber bumpers help protect paint and are all standard. The driver area is cut narrow in the front and is approximately 1in lower than the stock seat, and it works with Drag Specialties Seats driver backrest kit/pads and the OEM frame-mounted driver backrest mechanism and backrest pad. 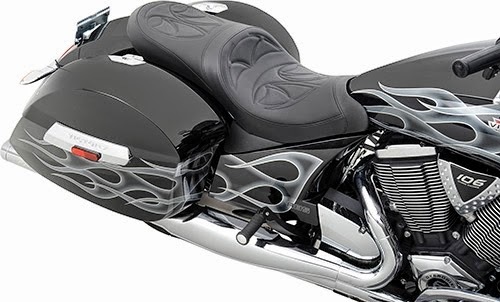 The seat is available to fit ‘09-‘14 FLHT, FLHX, FLHR, FLTR and FL trike models. Another seat option that employs solar-reflective leather in the seating area is the Low Solo seat for use on Dyna models. This seat is said to have a lower profile and improved fit. In addition, optional rear pillions are available in matching styles and feature EZ on and off system for simple install and removal. 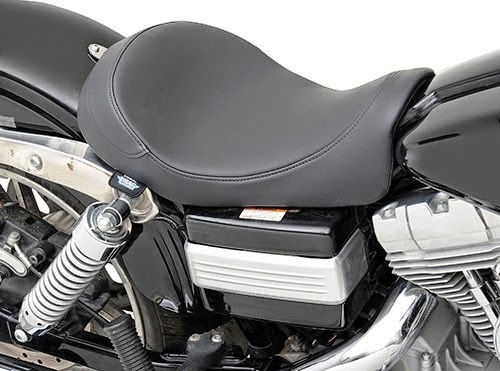 All Dyna Glide Low Solo seats come smooth or with a flame-stitched design, and are available to fit most ‘96-‘14 Harley Dyna Glide FXD, FXDWG and FLD models. 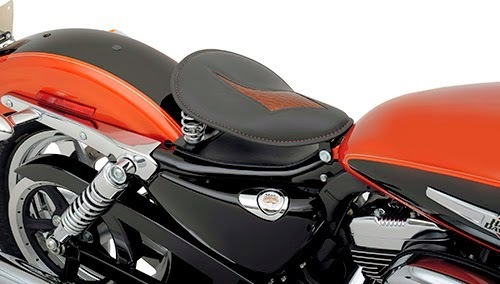 Included in the selection of new saddle options from Drag Specialties Seats is the small low-profile spring solo seat. It features a heavy steel contoured base with black finish, and includes an adjustable front seat hinge and two rear mount studs for springs. The inner construction of the seat is made of 1/2in closed-cell foam, and a variety of leather or vinyl styles are available.